Alan Ayckbourn is one of my favorite playwrights, and I'm looking forward to seeing two of his plays later this year. In August, Peninsula Players in Door County, Wisconsin, is producing "Comic Potential," a fun futuristic piece about a robot soap opera actress who starts to feel human (I am not making this up), and my husband is taking me as part of an anniversary celebration. And then, this fall, Heartland Theatre, right here in Bloomington-Normal, offers "Woman in Mind," a brilliant, subversive play about a woman who hits herself in the head with a garden rake and imagines a much nicer family for herself than the one she really has. Ayckbourn, to me, proves that comedy can be every bit as moving, as deep, as meaningful as drama. And sometimes more. That's why I'm especially happy that he will be receiving a special Tony Award for Lifetime Achievement at this year's ceremony. In conjunction with that, Pat Cerasaro has interviewed Mr. Ayckbourn on the Tonys website. Read, enjoy, and join me in watching to see what the master playwright has to say. Nicely said, Julie. Can't wait to hear your impressions this afternoon. Everyone loved hearing some of the inside story on judging these at the reception last night. Did you mean for this comment to go on the "Ten Minutes or Less" post up above instead of the Ayckbourn one? 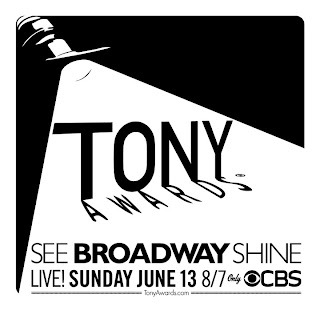 It's a busy Sunday with a Heartland performance and talk-back and the Tonys! I can't wait to see Alan Ayckbourn, though.